South Shields will host Garforth Town in the first qualifying round of the Emirates FA Cup, with the tie set to take place on September 8. The Mariners, who were promoted to the Evo-Stik NPL Premier Division last campaign (the seventh tier of English football), will hope to repeat their impressive run to the fourth qualifying round a year ago. 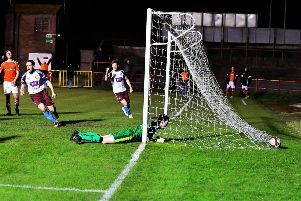 Last season, Shields defeated Bridlington Town, Witton Albion, Darlington and York City before losing 2-1 to Hartlepool United at Mariners Park. Garforth play in the Northern Counties East League Premier Division (the ninth tier), and have picked up four points from their first four games this season. The side from West Yorkshire are competing in the first qualifying round for the first time since 2012. Several Northern League sides were also involved in today's draw. Whitley Bay have been handed a home tie against Whitby Town, while Consett will travel to Congleton. Dunston UTS and Newcastle Benfield will host North Ferriby United and Workington AFC respectively. Sunderland RCA will face either Ossett United or Mossley at home if they can see off Clitheroe in next week’s Preliminary Round replay. Guisborough Town must also come through a replay against Albion Sports to book a home clash with Farsley Celtic. Northern Premier League Division One Morpeth face an away tie against Ashton Athletic. The ties will take place on the weekend of Saturday September 8.